ADCO Toy Hauler covers, made to fit Travel Trailer Style/Bumper Pull Toy Haulers, are designed to make cover usage easy. ADCO realizes that covering an RV can be a job, due to their immense size. 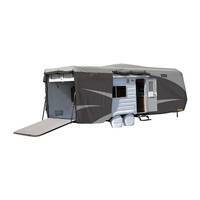 Each ADCO Toy Hauler cover comes with zippered access so that, once the unit is covered, you can still access anything you need without going to the trouble of removing the cover. Attached straps and buckles hold the cover in place. These straps and buckles also have a weighted assist, to help you take the straps from side to side much more easily. Corners are reinforced to prolong the life of your cover. The front and rear cinching system is excellent for tightening the generous fit of the ADCO cover, so that your cover not only protects your unit but looks great doing it.